As a blogger, there are tons of recipes I have that are in need of updating. Sometimes just the photos and sometimes the actual recipe as well. The Festive Foodies group has started a monthly redo of recipes, where we all share them on the same day. Remaking these Maryland Crab Cakes has been on my list for longer than I care to admit. From the stereotypes, I’m sure people think that Marylanders eat crab cakes all of the time, but that’s not actually true. While I love them and would love to eat them more often, the cost of crab meat has doubled since I first shared this recipe with you back in May of 2011, which definitely puts a damper on making these as often as I’d like. Not too long ago, one of Tom’s friends from Michigan came to visit. The weather was miserable while he was here and instead of constantly going out in the cold rain to show him all that Maryland has to offer, I decided to pick up some crab meat and make him homemade crab cakes so we could stay warm and dry inside. Crab cakes are served two ways here – either broiled or fried. Personally, I prefer them broiled because it leaves the crab meat as close as possible to it’s natural state and you taste the ingredients you’ve added to make it much more than you do with the fried variety. 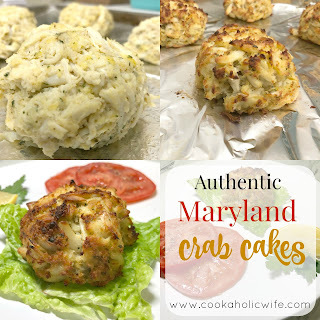 I used to follow the recipe on the back of the Old Bay can to make my crab cakes but eventually started branching out from it to see if there was anything that could be improved. Their recipe calls for breaking up two slices of bread into tiny pieces and soaking them in milk to use as the binding. I don’t mind this way at all, but have found by using Panko, it reduces the size of the filler pieces and somehow just goes a little bit better with broiling them. 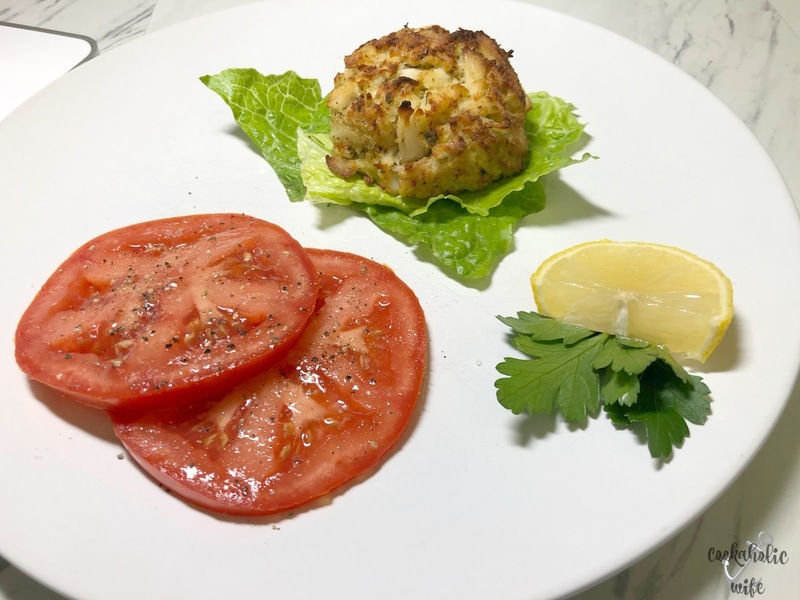 A state specialty, Maryland Crab Cakes are made with fresh jumbo lump Maryland crab meat, seasoning and very minimal fillers to really let the flavor of the sweet crab meat shine through. Carefully pick through the crab meat, removing any shells or cartilage, but keeping the large lumps of crab meat intact. Line a large baking sheet with foil or parchment paper and preheat the oven to broil. In a large bowl, combine the Old Bay seasoning, beaten egg, mayonnaise, worcestershire sauce, parsley and mustard. Whisk until combined. Gently fold in the crab meat and Panko until just mixed together. Form the crab mixture into 3 inch wide rounded patties. The mixture will be very loose but will just hold together. Place each on the prepared baking sheet. Broil for 10-12 minutes or until the tops of the crab cakes are golden brown. Divide between plates and serve on sandwiches or with crackers. Traditionally, a slice of white bread torn into tiny pieces is used in place of the Panko. I prefer the Panko because it binds the crab meat, but practically disappears once baked. 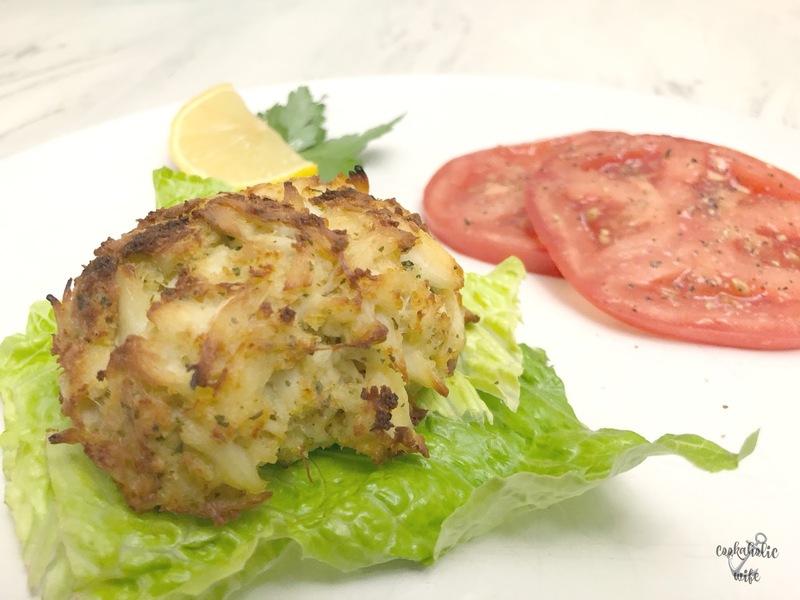 Most restaurants that serve crab cakes for lunch will serve them as a sandwich, on either a potato or kaiser roll with lettuce, tomato and mayonnaise. When they’re also offered for dinner as an entree, they come with a few packets of saltine crackers and usually two sides. Ever since I was a kid I’ve always preferred to eat my crab cakes with crackers. Of course there is nothing wrong with a sandwich, but when I enjoy a crab cake I want to taste the crab and the seasoning without the roll, lettuce, tomato or mayonnaise getting in the way. I hope you’re either in the area soon or have the ability to get fresh crab meat and try these out, because there is really nothing better than a good Maryland Crab Cake! And for the price you’ll pay for one in a restaurant, you can make a few at home instead! I can’t believe I’ve never blogged about crab cakes before. As a resident of Maryland, known for their blue crabs, I’m a bit of a crab cake snob. Okay, I admit it, I’m a full blown crab cake snob. But I can’t help it. Once you have a Maryland crab cake nothing else is as a good. 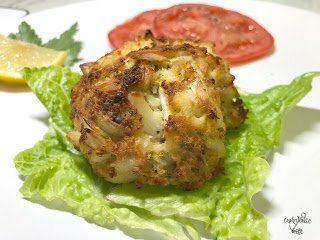 One thing in common about many of the great seafood restaurants in Maryland is that they all agree, a simple crab cake recipe is best. The crab meat needs to be the star. Everything else is just for texture, binding and color. Okay, fine, and flavor. I definitely agree with those restaurants and I’ve only ever made crab cakes one way; using the recipe on the back of the Old Bay can. If you’re not in an area where Old Bay is sold, I highly recommend that you head on over to http://www.oldbay.com/and purchase some. Immediately. Its not just for seafood. You can put it on chicken, pork, in burgers, on fries, popcorn, in salads, just about anywhere. That’s a piece of fresh lettuce from my mini garden! I love the idea of broiling them rather than frying. I've never tried them that way and now I can't wait to! My husband has always wanted to try crab cakes, can't wait to make them for him! I LOVE crab cakes….Thanks so much for sharing this recipe. We absolutely love crab cakes! I rarely make them at home, but this sounds so easy I will have to give it a try! I also LOVE Old Bay Seasoning. That stuff makes anything seafood taste delicious! Crab cakes are wonderful. I love them both as appies and on sandwiches. Crab cakes can be so tricky and yours look perfect! I love crab cakes, these sound very similar to ones my MIL makes. Yum! Broiled or fried…I pretty much know that these are delicious!!! It's a shame that crab meat isn't more affordable! Great recipe. We have now replaced our old crab cake recipe with this one. Served it to our neighbors and they said it was the best! These look great. That lump crab meat looks so succulent! A very Maryland crab cake indeed! Yum! These look so good. I love that there is more crab than anything else, which is how a crab cake should be! Mmm, love crab cakes and cannot wait to try this recipe!